When I started my online business in 2016, I had two young kids at home and a full-time corporate marketing job. Needless to say, I was very limited on time. Out of necessity, I had to leverage traffic strategies that didn’t consume all of my time or money. After months of trial and error, I discovered three Pinterest strategies that worked like gangbusters! These 3 strategies took my list from 0 – 500 in less than 30 days and from new blogger to profitable business in 20 months. In this post, I’m going to share my 3 surefire Pinterest strategies in detail so you can apply them to your own online business. 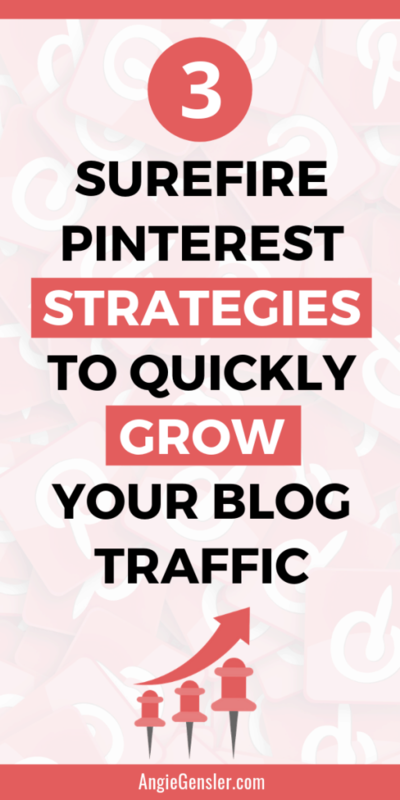 Why Pinterest as a Traffic Source? You’re likely aware of the more common methods to drive traffic (paid ads, SEO and social media), and you may be wondering why you should spend your time on Pinterest. Let’s take a look at the three most common traffic methods and why I chose not to focus on them when I first started my business. As an experienced marketer, I know first-hand that successful ad campaigns require thousands of dollars and numerous tests before discovering the right ad design and targeting parameters. My husband and I were not comfortable sinking a ton of money into paid ads for a brand new blog that we hadn’t validated. If you’re still trying to find your voice and build an email list or you don’t have a paid product or service yet, Facebook ads are probably not a good fit for you yet. SEO is fantastic and something every online business owner needs to learn, but it takes 6 – 9 months for your content to start showing in organic search results. And that’s if you know what you’re doing! I was too impatient to wait 6 – 9 months for our SEO efforts to kick in. I needed an abundant source of organic traffic and I needed it fast. Social media marketing is my jam. It’s what I teach and how I help entrepreneurs grow their businesses. For help growing your small business using social media check out my 2019 Social Media Content Calendar. While I love social media, I also know that it’s a constant hustle to drive significant traffic from traditional social media channels like Facebook, Twitter, and Instagram. If you’ve followed me for a while you know that I hate the hustle! Unfortunately, none of the traditional sources of traffic I had used in my marketing career fit my needs as a busy blogger. Refusing to give up, I began to search for alternative sources of traffic. That’s when my research brought me to Pinterest. I spent a few months diving deep into Pinterest – researching, experimenting, and refining my strategy. When I finally launched my blog in December of 2016, I had a solid Pinterest strategy in place. This chart represents my impressions on Pinterest the week before and the week after I launched my blog. The red arrow on the left is the day my blog went live, December 18th. On December 19th, I added 3 Pins to the handful of group boards I had joined. The red arrow on the right pointing to the huge spike is only five days after my blog went live. My Pins completely took off, which is nothing short of amazing for a brand new blogger. That huge spike in impressions translated to 5,344 page views and 543 email subscribers my very first 30 days as a blogger. And remember, I was working a full-time job and raising two young children at the time. It’s also important to note that my traffic wasn’t the result of hustling like crazy or trying 101 different traffic strategies. The majority of my traffic was generated from Pinterest and most of my Pinterest activity was automated. I used Tailwind to schedule 30 Pins per day to my own boards and my group boards. The entire process took me about 30 – 60 minutes each week. I was thrilled with the results from my first month so I decided to go all in with Pinterest and test more strategies. Over the next year and a half, I continued to learn, test, and refine my Pinterest strategy. I studied Pin design and discovered 7 ingredients for creating viral Pins which I call the Viral Pin Formula. I also became active in Tailwind Tribes, experimented with Promoted Pins, ran a few tests with BoardBooster, and dabbled with manual pinning. All that testing helped me discover three surefire Pinterest strategies that work together to create what I call the Pinterest Traffic Trifecta! Let’s take a closer look at each strategy of the Traffic Trifecta. Pinterest group boards are an outstanding way to get in front of other people’s audiences and collaborate with other influencers in your niche. Group boards look and act like regular boards, but instead of one person adding Pins, multiple people add Pins to the board. When you join a group board, your content will potentially be seen by the other contributors to the board as well as the followers of the board. Take a look at the screenshot below from one of my group boards. This board has 45 contributors and over 82,000 followers! Now, to be completely transparent, Pinterest is not going to put your Pin in front of every single follower of the board. In fact, you’ll be lucky to be seen by a small percentage of the board followers. Let’s be conservative and say your Pins will be seen by 1% of the board followers. If you do the math, 1% of 82,000 is 820. I don’t know about you, but when I was brand new and only had 50 followers, I would gladly get my Pins seen by 820 people! If you don’t already have a solid group board strategy in place, I encourage you to start now. For help getting started with group boards, read: The Ultimate Guide to Pinterest Group Boards (How to Find, Join, and Pin to Group Boards on Pinterest). To understand Tribes, you first need to know about Tailwind. Tailwind is an online software service to manage your Pinterest and Instagram accounts. 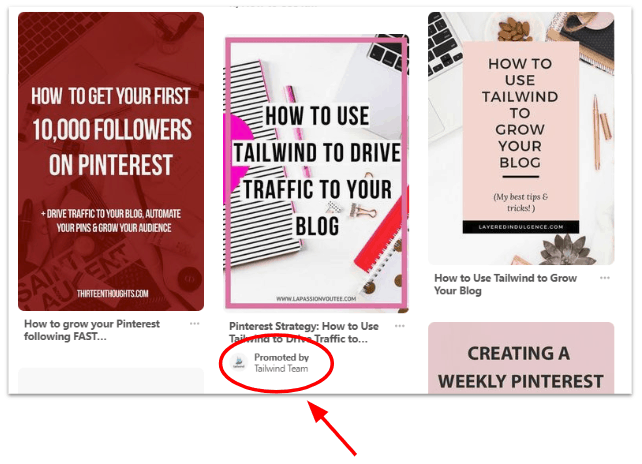 I use Tailwind primarily for Pinterest and it saves me hours each week by allowing me to schedule hundreds of Pins in minutes. Tailwind is an amazing company and they created Tribes to help their customers collaborate and work together to grow their reach. A Tribe is a group of people who share their Pinterest content with one another. Essentially, Tribes are like group boards, but they live within the Tailwind platform and they’re much more effective. Here’s a screenshot of the Tribes tab within Tailwind. This screenshot is taken from my Tribe, Social Media & Digital Marketing. The members of my tribe are other marketers wanting to share their content as well as bloggers looking for great tips to grow their business. Each Tribe member is allowed to add content (Pins) to the Tribe and other Tribe members are expected to share that content out to their Pinterest boards. The true magic of Tribes is in the analytics. As a Tribe owner, I can see how many Pins each Tribe member has added to the Tribe as well as how many Pins they have shared from the Tribe. If someone isn’t being a good Tribe member and they’re not sharing as much as they’ve added, I can kick them out with the click of a button. Additionally, as a Tribe member, you’re able to see real-time stats on your Pins. This data is extremely helpful to learn which Pin designs and headlines perform well and which ones don’t. Tribes are an absolute game-changer for Pinterest marketers! If you aren’t using Tribes to grow your blog yet, you can use my referral link to start your free trial. Then read How to Use Tailwind Tribes (And Explode Your Website Traffic) for a detailed guide on how to get started with Tailwind Tribes. 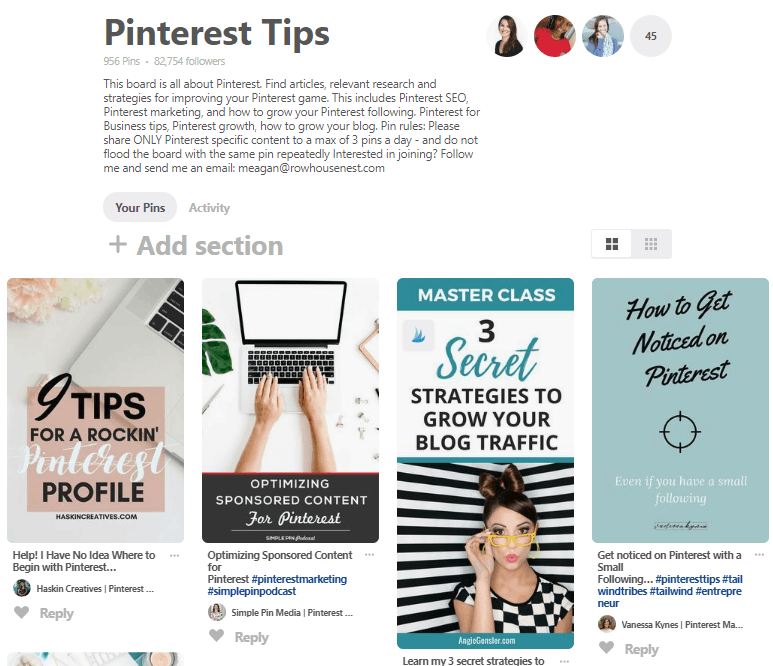 The final strategy in the Pinterest Traffic Trifecta is Promoted Pins. Promoted Pins are paid ads on Pinterest and they look like regular Pins in the feed. Promoted Pin campaigns are an outstanding way to supercharge your content on Pinterest and give your Pins a boost. You may be wondering why I was willing to spend money on Pinterest ads and not on Facebook as a new blogger. There are a few reasons I recommend starting with Pinterest ads. First, Pinterest ads are easier to learn and setup. Pinterest has an intuitive ads platform which means you don’t need to hire an expensive ad strategist or spend hours learning the platform before you figure out what works. As long as you understand how to structure ads and know a few pro tips, you can manage Pinterest ads on your own. Second, Pinterest users are on the platform actively looking for ideas and items to purchase. Facebook users are typically on the platform to connect with friends or kill time. You have to work extra hard (and spend more money) to interrupt them and get them to click. That’s not the case with Pinterest ads. And finally, because Pinterest is a search engine AND a social network, content lives forever and tends to spiderweb throughout the platform. Spending $5 – 10 to promote a new blog post helps that Pin take off much faster and perform better in the long run. If your Pin gets good engagement, it’s a signal to the Pinterest algorithm that people like your content and your Pins are more likely to be shown organically in the Smart feed! 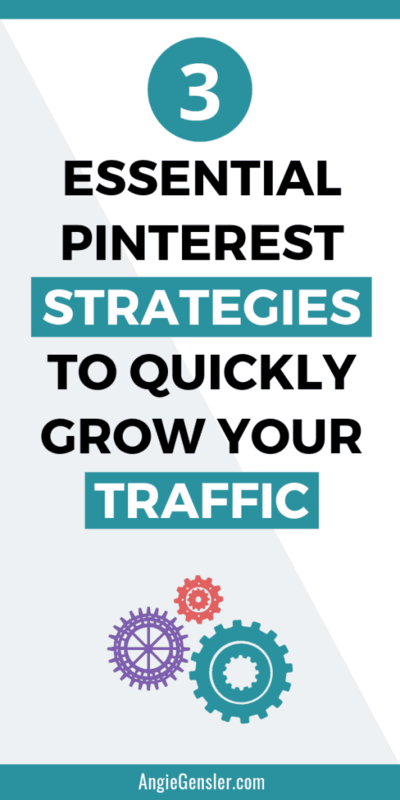 The best part about the three Pinterest Traffic Trifecta strategies is they can generate results in 30 days or less even if you’re a brand new blogger or online business owner. I’d love to have you attend my free training: How to Grow Your Email List from 0 – 500 in 30 Days or Less Using Pinterest.